Today is the first day of school for most kids in the Milwaukee area, and a lot of them will be riding their bikes. I have a feeling that none of them will be riding a Whizzer. 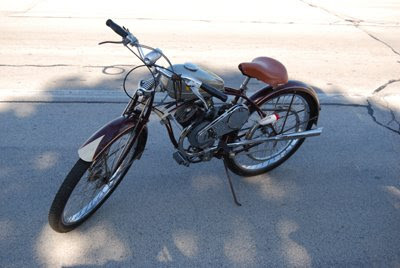 I saw this 1947 model on Saturday, and it was an interesting contrast to all the "big bikes" around town. That's a very cool ride. I have a shot of a tandem version I found a while back. I wouldn't mind having the Milwaukee version!